Both forms are readily available for sale in nurseries and garden centres across Australia. Said to flower from Spring through to Autumn, we do think that this could be almost year round in Australia as the climate is a little warmer than in the UK where it was developed. For us the main flush of flowers is in late spring, the flowers are small however plenty of them make up for that. Although it is a daphne that certainly flowers best in spring, and again in autumn it seems to flower sporadically in summer and winter as well. We tend to think that a little moisture and protection over summer does wonders for this daphne in out climate, so full blazing sun on 40C days, we would avoid. This is a hybrid so its real name is Daphne x transatlantica ‘Eternal Fragrance’. Both the white and the pink forms are easy care daphnes that can handle a little more sun than most. 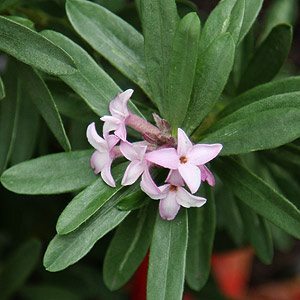 Due to its dense foliage once established, you could use Daphne Eternal Fragrance as a low hedge or border in the garden. It is equally at home planted in a container. 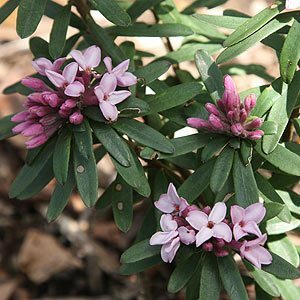 The variety named Daphne ‘Spring Pink’ is particularly attractive with good fragrance. 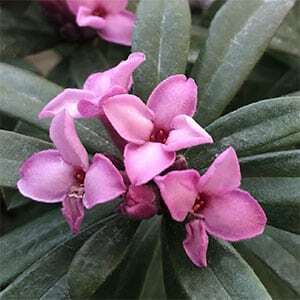 Sold as growing well in full sun, we have not yet seen Daphne Eternal Fragrance through a hot summer in full sun. Ours are planted in morning sun and afternoon shade. Daphne ‘Eternal Fragrance’ doe s require a well drained soil. Although Daphne ‘Eternal Fragrance’ is said to require little to no pruning we find this not to be entirely true, as with some other species. Our climate is warm, good soil and with good growing conditions from spring through summer. We find that as with many species you can prune then back after flowering in spring. The trick is to prune them to some good leaf growth, and to make sure you do this in warm weather when the plants are in full growth. This means you can keep a really bushy shape, and promote new growth. If this concerns you then keep to tip pruning, however it does work for us. Problems include the usual leaf eating insects, yellow leaves due to mineral deficiencies, and root problems due to poor drainage. All of these are easily overcome. Yellowing foliage over summer is common in daphnes.